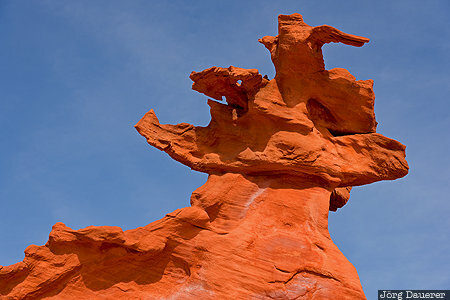 The delicate red sandstone formations of Little Finland (also known as Hobgoblins Playground and Devils Fire) below a blue sky. Little Finland is in Clark County near Mesquite in the south of Nevada, United States. This photo was taken in the afternoon of a sunny day in October of 2016. This photo was taken with a digital camera.